Why should you keep a diary? I have recently been leafing through my old diaries from the nineties. There are things that I really don’t remember at all, which is a worry. I was full of hope for the future; it’s an odd feeling looking back, I feel quite protective of the young lady I was then, knowing what I know now. My mum says that I’m like a cartoon character – I keep getting squashed by a boulder but always somehow manage to ping back to life again. There goes that old song in my head ‘Pick yourself up, dust yourself off, and start all over again’. The whole saga is chronicled in my mum’s diaries too. Oddly enough, as she was looking through them to help me remember events during the house build for my book – as well as providing me information about what the weather was doing at the time, she realised that her 2010 diary was missing, we hunted high and low but it had gone. No, it wasn’t me – I didn’t do anything particularly dastardly that year, so you can stop pointing the finger. Now we will never know now what the weather was doing in 2010, unless we Google it of course. We discussed what would happen to her diaries when she departs from this earthly life. She said to burn them, but I think not. Since writing Mud & Marriage I have now got into the habit of keeping a diary, not every day, but I know that looking back on them one day will give me a great sense of amusement. I wonder why we only remember the highs and lows. It’s a puzzle how only a few strange details filter through. I suppose we file many things away in the pleats of our mind, and there they will stay I expect. (Or until you become friends with someone on Facebook who you knew when you were fifteen and it all the embarrassing moments come flooding back). I have written notes in my diaries for people to read on my departure to the heavenly realms. I’ll be glad to give people who might read them some food for thought. Wagging an advisory finger from a different dimension is safer I think. I’d better hide them until then eh. We had some visitors today who have read Mud & Marriage – I was very pleased indeed to show them round the house. Mr Clark and I showed them the photo book we made of the house build from start to finish and they said that it must have been a huge task. Looking back, yes it was, but while you are living it, you just live it and get on with it. Keeping a diary is a great thing – It shows you how far you’ve come and that things usually turn out alright in the end. I’d do it all again – it’s an adventure, and even though unpredictable events may be daunting at the time, they make for an interesting story. You can buy Mud & Marriage – A Housebuilding Adventure from Amazon.co.uk or from this website. This entry was posted in Self-Build, Uncategorised and tagged cartoon boulder, Diary, embarrassing moments, Facebook, Google, keeping a diary, Photobox, self build, the nineties, Wile E Coyote on 22nd April 2015 by Mandy Clark. Builders make a nice fat profit – without a main contractor you could afford a house worth 30% more. It isn’t as hard as you think it is, you’ve seen Grand Designs, they all end up with a lovely house and you don’t even need Kevin McCloud (even though it would be nice). If you have friends in the building trade – shamelessly pick their brains. Trust your gut feelings, your instincts are probably right when employing subcontractors (you’ll see what I mean when you read the book). If you would like to read my book Mud and Marriage and find out all about my housebuilding adventures, you can buy it from Amazon.co.uk or from this website – Kindle edition out now. 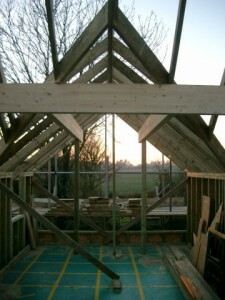 This entry was posted in Self-Build, Uncategorised and tagged budget, building trade, grand designs, Kevin McCloud, loft hatches, main contractor, quotes, self build, subcontractors, trust your instincts on 22nd February 2015 by Mandy Clark.